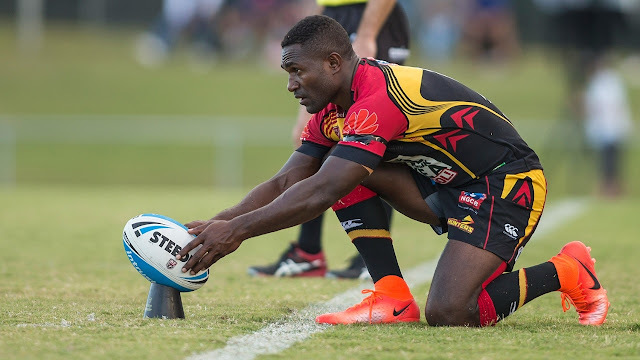 PNG Hunters captain Ase Boas is ready to lead his side into the finals of the Intrust Super Cup this season. The Hunters secured the 2017 minor premiership during their second-last game of the regular season and their last at home after overcoming Wynnum Manly Seagulls 28-22 in Round 24. Boas has since been honoured at the QRL Major Competition Awards where he took out the Intrust Super Cup’s Courier Mail Medal for Best and Fairest player. He also claimed the XXXX People’s Choice award. Boas, who is a policeman by profession, has been a strong performer for the Hunters on and off the field and said he was honoured to be leading his team. The leadership role has come naturally to Boas as he has been in a similar position since school boys level, all the way up to the semi-professional level. He is now leading his country’s team in the Intrust Super Cup competition and has been the focal point of Hunters attack all season. There is no doubt he will play a pivotal role heading the Hunters as they move into the final series which begins for them this Sunday against the second-placed Redcliffe Dolphins at National Football Stadium. The atmosphere around Port Moresby at the moment is very intense, with people looking forward to the game and hoping to see their team make it through. The Dolphins will be tough competition and defeated the Hunters 28-12 in their last meeting in Round 21 at Dolphin Oval. They also came close to defeating the Hunters in their earlier Round 7 match at National Football Stadium, only going down 12-10 – with a Boas penalty goal the difference. His general kicking game were on fire during the season and will be looking forward to guide his side into the finals.